The monster doesn’t usually live under the bed – but he might live in your neighborhood. And one day, a lifetime later, you might tell everyone what you saw. Edgar Feuchtwanger does just that in Hitler, My Neighbor. And Germany’s hit TV show “Babylon Berlin” – newly available in the U.S. – tries to explain how everyday people got caught up in the madness. Other hard stories of the Holocaust have found their way into the light through music and dance (Light / The Holocaust and Humanity Project, performed by Nashville Ballet February 9-11; The Violins of Hope, conducted by Giancarlo Guerrero with the Nashville Symphony March 22-24). Today’s post touches on Hitler, My Neighbor and “Babylon Berlin,” looking more closely at some remarkable offerings in Nashville over the next few months. In 1928, 2.6% of the German electorate voted for the Nazi party. Five years later – 44%. The German hit TV show “Babylon Berlin,” set initially in the year 1929, seeks to illuminate what happened. “From an historical perspective the series is very acute in showing how Weimar democracy was under attack both from the communist left, as well as by traditional conservatives, in a kind of unholy alliance,” says Thomas Weber, a German historian. Democracy can be – well – fragile. “Babylon Berlin” comes in right behind “Game of Thrones” as Germany’s second-most-watched show. A series of conversations and artistic happenings in Nashville from January through March promise to meaningfully explore the Holocaust and its relevance to our times. Nashville Ballet presents Light / The Holocaust and Humanity Project February 9-11, 2018. 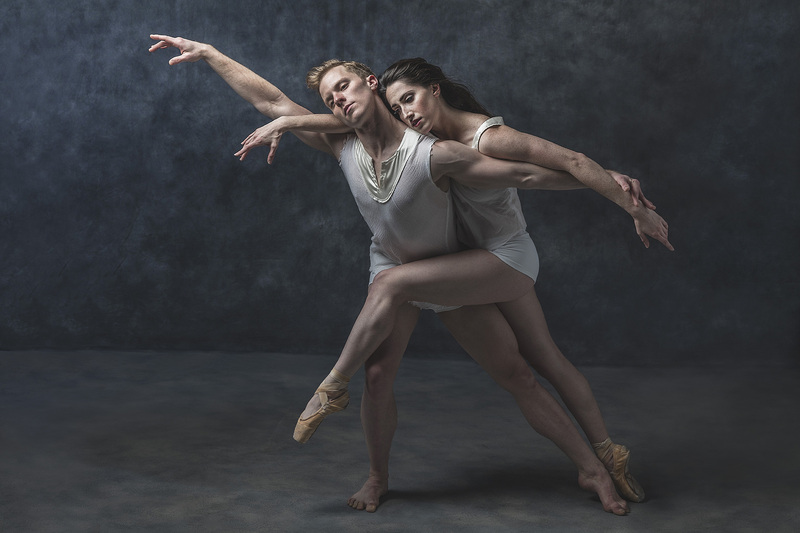 Pushing the boundaries of Nashville Ballet’s acclaimed Attitude series, Light / The Holocaust and Humanity Project offers a groundbreaking exploration of devastating loss, resilience and, ultimately, the triumph of the human spirit. Following Holocaust survivor Naomi Warren’s story, Light offers a unique opportunity to feel, better understand and reflect upon a piece of history that defies comprehension. The ballet illuminates the past to promote compassion, understanding and hope to issues relevant in today’s society. Music by Philip Glass, Arvo Pärt, Steve Reich, Evelyn Glennie, and Michael Gordon. Stay after the performance for a talkback with Ballet Austin Artistic Director/Choreographer Stephen Mills, Nashville Ballet Artistic Director & CEO Paul Vasterling and Tennessee Human Rights Commission Executive Director Beverly Watts. Community programming accompanies this Nashville Ballet premiere. Please see the Calendar of Community Events for ways to participate. Friday, February 9, 2018, at 7:30 p.m.
Saturday, February 10, 2018, at 7:30 p.m.
Sunday, February 11, 2018, at 2 p.m.
Naomi Warren grew up in Wolkowysk, a small city in eastern Poland. She was part of a large, cultured, and highly educated family, where Jewish traditions complemented secular pursuits…. Decades later, Naomi still recalls the wonderful aromas that came from her mother’s kitchen during the Jewish holidays. Naomi was finalizing arrangements to attend a university in England when Germany invaded Poland in September 1939, foiling her plans. Shortly after, Soviet troops marched into Poland from the east, occupying her hometown. The Soviet presence offered liberation of sorts: since Jews were no longer limited by quota in Polish universities, Naomi could enroll at the university in nearby Bialystok. At the beginning of 1940, she married Alexander Rosenbaum, a young physician she met on the train to Bialystok. In the summer of 1941, Germany overran eastern Poland and began systematically isolating, interning, and murdering its Jewish population. Naomi and Alexander were sent to Auschwitz-Birkenau in January 1942…. They were separated when they arrived, and Alexander was sent to the men’s camp where he perished several months later…. Despite Naomi’s determination, constant work and starvation rations took their toll…. But she toiled on because she knew that if she stopped, she would be sent to the gas chamber. Naomi endured almost three years in Auschwitz-Birkenau. As Soviet troops approached in the beginning of 1945, she and her fellow inmates were sent to Ravensbruck and then to Bergen Belsen. Don’t miss your Nashville Symphony’s gorgeous, heartwrenching program in March featuring the Violins of Hope, a collection of instruments played by Jews during the Holocaust. Thursday, March 22nd, at 7:00 p.m.
Friday, March 23d, 2018, at 8:00 p.m.
Saturday, March 24, 2018, at 8:00 p.m.
Come early to the concert for a Classical Conversation with Maestro Giancarlo Guerrero, taking place one hour before the concert in the Balcony Lobby. Following the concert, Maestro Guerrero will lead an informal Q&A at the back of the concert hall, on the Orchestra Level. Each instrument has a story. The man threw his violin out the narrow window. It landed on the rails and was picked up by one of the French workers. For many years the violin had no life. No one played it. No one had any use for it. Years later, the worker passed away and his children found the abandoned violin in the attic. They looked to sell it to a local maker in the south of France and told him the story they heard from their father. The French violin maker heard about Violins of Hope and gave it to us, so the violin will live. 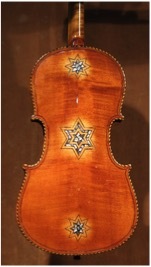 This is a lovely violin made originally for a klezmer musician. The restoration work is dedicated to siblings Wolf and Bunia Rabinowitz, both wonder-kids and talented violinists. Both played multiple concerts in the ghetto of Vilna during World War II, and both were killed with the last members of the ghetto, most probably in the forest of Ponar, about 10 km outside the city. In 1942, he was sent to a labor camp and then to Auschwitz-Birkenau, which he somehow survived with his violin. I paid him for his violin, feeling that I’m doing a mitzvah. As time went by, I put the violin away and forgot all about it. Three years later, I returned to Israel and discovered the violin inside one of my many crates. For a moment, I felt that the violin was following me so that one day it could tell its sad history. Many years later, when my grandchildren grew up, I remembered the violin lying in the attic and decided to bring it to a violin maker I heard of, Amnon Weinstein in Tel Aviv. The rest is history, you may say. 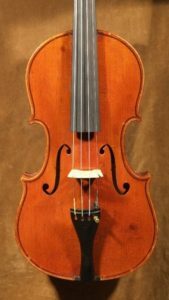 This violin does not play, but allow me to be poetic and sentimental and say that its silence is powerful, its silent strings touch hearts, and it is an authentic tombstone to many unknown and nameless violinists who died lonely and forgotten. This violin wasn’t made by hand, but rather by using machines. 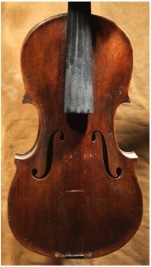 Although it looks like a violin, it doesn’t produce any sound. 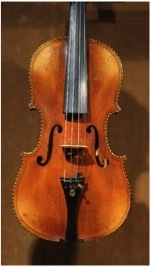 This type of violin usually belonged to beggars who made believe they played, but actually sang the music. 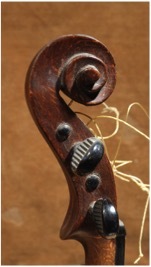 The Violins of Hope will be on view at the Main Public Library March 26th – May 27th. Learn more about community-wide conversations at ViolinsofHopeNashville.org. Thank you for this post, Jennifer. We remember so history will not repeat itself. I learned about “Babylon Berlin” just today on NPR and am intrigued. The Violins of Hope stories are profound and inspiring. I encourage everyone to attend “Light”, a story of hope and survival. The talk-back with Stephen, Beverly, and rock-star Paul is not to be missed, I think these topics are relevant today more than ever. betterthangreat post, Jennifer, thank you!